Translations of these lines into different languages deal with the meanings of “fair” and “black” rather differently. Mikhail Lozinskij’s Russian translation says “Since honor is a source of light of virtue, / Then your son-in-law is light, and by no means black.” Christopher Martin Wieland and Ángel Luis Pujante used white in German and Spanish (respectively) to translate “fair,” while Victor Hugo chose “shining.” It’s eye opening to see how translation opens up the text in new ways. 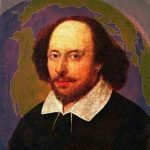 Another fun item to consider: I was recently interviewed by BBC Radio and was asked to put together a collage of recitations of Hamlet’s “to be or not to be” speech in different languages, drawn from actual performances. The vague, versatile, and “Swiss-knife” verb “to be” is as ambiguous in English as it is in many other languages. Sometimes it is translated as “to have” (but to have or not to have what!? ), to do, to die, and so on. Alexander Huang is Director of the Dean’s Scholars in Shakespeare Program and Associate Professor of English at George Washington University in Washington, D.C. and Research Affiliate in Literature at MIT. The recipient of the MLA’s Aldo and Jeanne Scaglione Prize, he chairs the MLA committee on the New Variorum Edition of Shakespeare. The co-founder and co-editor of Global Shakespeares, Huang serves as a General Editor of the Shakespearean International Yearbook and performance editor of the Internet Shakespeare Editions.